East Rutherford, New Jersey’s MetLife Stadium is still in shock from the blowout victory from the Seattle Seahawks, during Super Bowl XLVIII. Russell Wilson and company weren’t the only ones who experienced a victory on Sunday, February 2. In addition to the excitement from the game, the halftime show was an extravaganza within itself. Enter Bruno Mars. 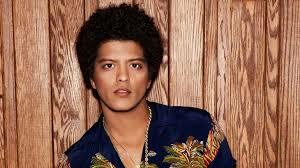 It’s no surprise that 28-year-old Peter Gene “Bruno Mars” Hernandez has undeniable swag. The show began with a children’s’ choir singing a gospel tinged version of the hook from Travie McCoy’s “Billionaire”, co-written by Mars. Clad in a gold lamé suit, complete with a his Pompadour hairdo, the Honolulu native sizzled as he approached the stage, playing a jaw dropping drum solo on a floating platform. The solo morphed into a rousing performance of his mega hit “Locked Out of Heaven”. Bruno Mars was backed by his crew, a.k.a. the Hooligans, who were clad in their matching gold lamé suits. Bruno and company, then, slid into the delightful old school inspired “Treasure”. Spiced with James Brown-esque footwork, the multi-talented entertainer changed the tempo for the energetic “Runaway Baby.” The crowd went ballistic – and that was only the beginning. At the tail end of “Runaway Baby”, Mars mimicked an impromptu version of The Red Hot Chili Peppers’ 90s hit, “Give It Away“. In almost a blink of an eye, the veteran rockers were on stage with him. Bruno’s version transformed into the Chili Peppers original version and suddenly, it was 1991 again and the glory days of MTV were back. As Mr. Mars stood alongside the Chili Peppers, 51-year-old front man Anthony Kiedis led both bands into an energetic thrashing of the hit, reminiscent of a Woodstockish escapade. As Chili Peppers guitarist John Klinghoffer concluded with his Slash inspired guitar solo, the two bands jumped in unison before the Peppers vacated the stage, ending their memorable “battle of the bands” fiesta. Soon, a series of dedications from American troops were shown, as Bruno, amid a giant fireworks display, concluded his electrifying set with his sentimental hit “Just the Way You Are”. Even with the absence of “Grenade”, once the show was over, any non-believer who didn’t think that Mr. Mars was worthy or capable of commanding a half time show had no choice but to regrettably eat their words. Way to go Bruno! 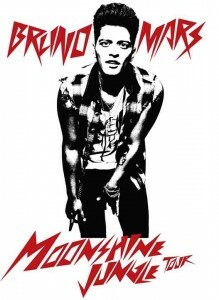 Tickets for the Bruno Mars Moonshine Jungle tour went on sale February 3rd and from the reaction from his halftime performance, we’re certain the demand will be at an all time high! Ashly is a freelance writer and poet from Baltimore, MD.